This SerialBrain2 really has some fascinatingly “critical” decodes. Yes, I am extremely amazed and entertained by these decodes. I strongly suggest to view the 5 decodes images from SB2, about halfway down the article. These decodes articles by SB2, for me at least, “keep the faith alive” as we go through this process of dismantling the deep state. And that’s one reason why I post them. As always, be prepared for an And We Know video highlighting this SB2 post, coming soon! “…with the training you have now received, you already know Covington was a smoke screen designed by the Deep State to distract us right?… In my January 19th 2019 morning post, I told you about the assassination attempt on POTUS, its connection to JC [James Comey], sleeper cells in the US, ANTIFA, Taheb and the related shenanigans with Nancy and her puppet Chucky. “This Covington incident was planned by the Dems and executed by ANTIFA, in the disguise of the so called Black Hebrew Israelites who were present only to create problems. 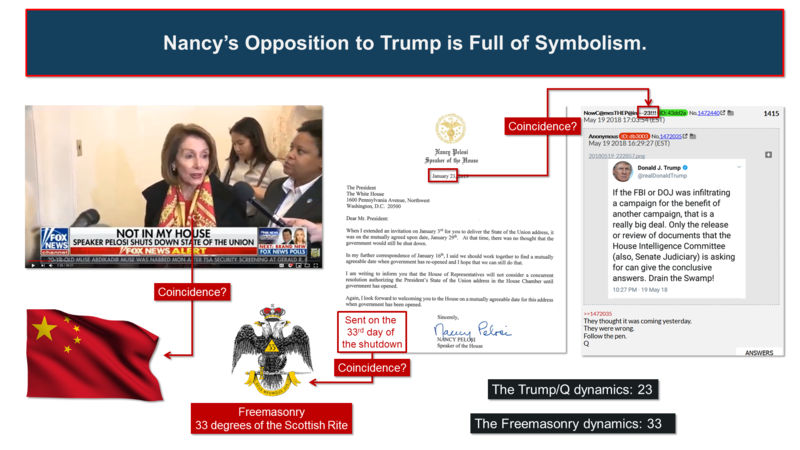 “…go through all the Maestro’s tweets posted on Jan 20 2019… connect the timestamps to their corresponding Q drops… Nancy… commenting on the cancellation of the SOTU video… wrote to Trump on the 23rd?… the number 23 symbolizes the Trump/Q dynamics as hinted in the password revealed in Q1415… January 23rd 2019 was the 33rd day of the shutdown… the number 33 symbolizes Freemasonry… How about the colors of the scarf she wears the day she is openly defying Trump? Exactly the same colors as the Chinese flag. I also told you about Lincoln’s assassination, the mysterious moving 4 and how it was related to Taheb’s arrest in Georgia. Peruvian coffee for those who caught that, the same day, the Maestro tweeted about Abraham Lincoln and moved his scheduled live speech from 3PM to 4PM. Img1 Coincidence? You know what’s going on right? Double Peruvian coffee for those who noticed the theme of the day for the Maestro’s tweets was the number 4! And a very special mention for those who solved this one using the SECRET OF NINE and what ONE NINE represents. Difficulty level? High. As confirmed by the Maestro in the tweet: ‘Not easy!’ Happy hunting! The Maestro also told us who executed this communication operation for her. Look at the tweet capital letters. Making sure you group them as hinted by the dash between ‘false’ and ‘smeared’, you get: NNNATC=66=PLANNED and LNSCC=51=ANTIFA. This Covington incident was planned by the Dems and executed by ANTIFA, in the disguise of the so called Black Hebrew Israelites who were present only to create problems. You remove them from the picture, Covington would have never happened, as well explained here.